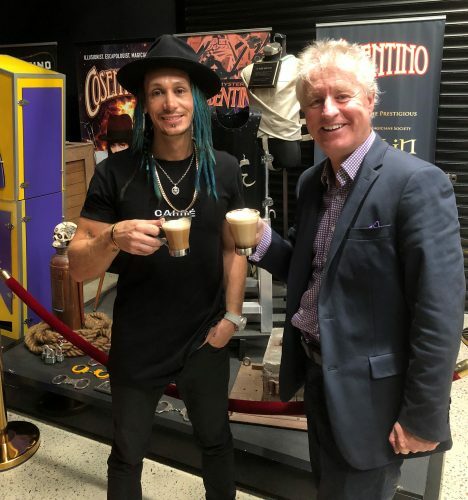 Illusionist, escape artist, multiple bestselling author and an all-round nice guy – Cosentino kicks off our “White with one” series for 2019. PJSE have had the pleasure of working with him on multiple occasions but how does he take his coffee and how did his career all start? Read about it here. Weak latte with one sugar. I would have a maximum of two a day. First one when I arrive at the office and I can have the last as late as 8pm and still get to sleep. A Thousand Blessings in Richmond. Peter: So how did your career all start? My career as a performer started when I was 12. My Mother was a school principal and I struggled to read. I actually didn’t read my first word until I was 12 years old. It was not until I found a book in the library called ‘The Encyclopedia of Magic’ that I really began to learn to read properly. At the back of the book were instructions on how to do magic tricks. These were complex instructions that my Mother and I would read together. Reading these instructions and practising the tricks was the way I learnt both to read and develop a life-long passion for magic. Having had that experience as a child, it’s also one of the reasons why I’m so passionate about writing children’s books now. There have been so many. Being the runner up on Australia’s Got Talent in 2011 was very special, as that was the show that really launched me to the Australian public. Mind you, I had been performing for 15 years prior to that so I was hardly an overnight sensation! More recently, I’m very proud to have written, produced and starred in my own TV specials that have been shown in more than 40 countries around the world. In addition to the actual performing side, I’m thrilled to be able to extend my creativity and passion into writing books and developing a signature range of magic products. I’m officially a bestselling author and I have released 5 books so far. That’s pretty mind blowing for someone who couldn’t read until they were 12 and hated books! Having my first acting role in a Jackie Chan movie was also pretty special. Peter: Who are your most admired performers? There are many. Names in the magic world such as Harry Houdini, David Copperfield and David Blaine have all been an inspiration to me. But I am truly inspired by people who are the undeniable pioneers of their respective professions. People like Walt Disney, Nikola Tesla, Gene Kelly, Bruce Lee and Arnold Schwarzenegger. Peter: What’s great about Melbourne? I love the creative vibe. I find a place like Sydney more established and commercialised. We’re a bit more free spirited here, which suits me fine. Peter: Ever thought of getting a “real” job? Never contemplated it! I count myself as very fortunate to do what I truly love as a job. Peter: What does the future hold? I certainly plan to keep performing and evolving the show, as I’ve continually done over many years. My focus is always on delivering bigger and better live shows here and overseas. I also want to continue expanding my illustrated children’s book series ‘The Mysterious World of Cosentino’. Peter: If you could perform anywhere worldwide, where would it be? You’d probably think I would say Las Vegas, but I’ve always wanted my own Broadway show. Every time I go there, I think maybe that could be me one day. Peter: Tell us a bit about what happens behind the scenes that the audience would never know about. People watch me perform and see the beautiful production unfolding on stage, but most don’t understand just how real and dangerous the escapes are that we perform live in every show. Some of my scariest moments have included having ruptured my eardrum in a water escape and having 12 stiches in my face as one of the knife acts got a little too close. In one 60-minute special for Channel 7, I was in the Emergency Room 3 times! I would like to be the Premier of Victoria so I could abolish all parking fines! The Melbourne Magic Festival. It is a wonderful showcase of magic talent, both amateur and professional. I have been an ambassador for the last 3 years. Peter: What’s coming up this year for you? We are partnering with Live Nation to stage our new national tour in June/July. It’s our first Australian tour since 2015. We are making a new TV series in Asia which will be seen in Australia and around the world later this year. There will be more books released this year and our signature magic range will be released in Asia, the USA, and across Europe. Peter: Thank you so much for your time today. Can’t wait to check out your new show in June!